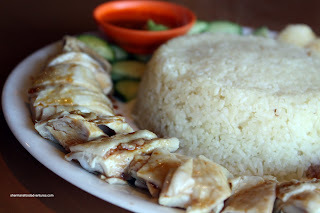 Hainanese Chicken, an often misunderstood dish since the name implies an origin within China; yet it is a dish associated with Singapore, Thailand and Malaysia as well. Widely considered the national dish of Singapore, there are a few variations of Hainanese Chicken among the different areas. However, the basic items are constant such as the poached chicken and chicken oil rice. The trick to make the chicken tender and juicy is to never let the water boil. Moreover, the proper technique to make chicken oil rice is, as in the description, to use the leftover chicken oil to stir fry the rice before cooking it in the leftover chick en broth. Many places cheat and do not use this process, resulting in a mushy and non-aromatic rice. So far, it's been difficult to find the perfect Hainanese Chicken; but Prata Man does a pretty good version (I'm not sure about their other dishes though... a bit substandard). You can find other variations at Mui Garden (free range, it's chewier), Banana Leaf, Tropika and Hawker's Delight. 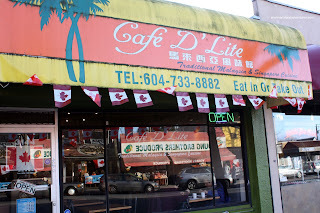 Today, on our way to the women's ice hockey game between China and Finland, Viv and I stopped by Cafe D'Lite to give their Hainanese Chicken a try. I decided to order the large single order since it looked so pretty in the picture. You see, it's a formed bowl of rice surrounded by boneless pieces of dark meat. I'm happy that it was boneless since that is the correct way of serving it. Too many a time, there are bones, which is a no-no. The chicken, in my mind, was pretty good. Tender, juicy and with a light drizzle of sweet soy, this would give Prata Man a run for its money. However, and this is a big however, the rice was terrible. 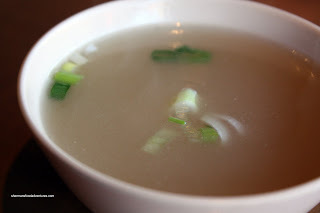 Consisting of mainly broken rice, it was mushy and dry and the same time (not sure how that can be). Furthermore, it was flavourless and lacked the oil gloss that makes the chicken rice taste and look good. That in itself spoiled the dish for me. 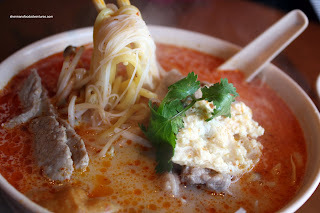 We also got a Beef Laksa and it looked pretty good. Yah, oil slick at the top is normal. I thought noodles were done right and the broth itself was decent, maybe lacking a bit of coconut flavour. It wasn't as spicy as I would've liked it; but it's my bad for not specifying. Honestly, except for the rice, I thought the meal was solid and I'll probably return. However, I hope this was an off day for the rice because it was not very good at all. Kim, I was a bit shocked how substandard the rice was. Hoping it was an off day. "The trick to make the chicken tender and juicy is to never let the water boil. " LOL... I've made Hainanese chicken at home countless times. No salmonella yet! Man, I've done all those chicken dishes at home, except for the Shajiang chicken. But I really like the baked salted chicken over the steamed chicken with the salted sauce. In my dipping sauces, I also add some of the reserved chicken stock, in addition to some fish sauce for the sweet soy drizzled on top. I don't particularly like grinding up my ginger. I usually do the painstakingly hard way of using a cleaver to mince the ginger. That way, more of the ginger juice is not lost in the grinding process. With too much juice extracted from the ginger, the sauce also gets too spicy. I love their Hainan Chicken, especially love the fact it's de-boned. I think they must be having a off day, cause if memory serves me right, their rice is flavorful and definitely not broken up. Yah, I've heard that the rice is not supposed to be like that there. But... it was and I didn't like it. Very strange... Great chicken though!